In the recent Budget Statement 2013, there are 2 drastic cooling measures introduced to curb the exorbitant COE prices (as high as $90,000 just for the COE). If you have thoughts of owning a car in Singapore, you should know these 2 new cost structures. Before we begin, let’s take a look at cost components of a lower end car - a Corolla Altis. Now, we look at the 2 cooling measures their effects. MAS has issued a mandate to cap vehicle loan amount. The loan amount depends on the vehicle’s Open Market Value (OMV). And, the loan tenure is max 5 years. Taking the example of the Corolla Altis that cost $137,988, you can only loan from the bank at most $82,792 (60%). You have fork out $55,196 cash! This prevents car buyers from spending more than what they ought to - by taking too much bank loan. How many times have you heard of car owners spending half their salary to pay off car loans? This measure curbs these borrowers. LTA has issued a new structure to tax a car. 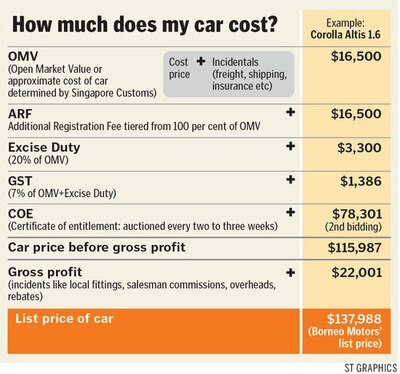 To buy a car in Singapore, you have to pay Additional Registration Fee (ARF). This is in addition to the vehicle cost/OMV of a car and COE. Traditionally, ARF is 100% of a vehicle’s OMV. So if a car OMV is $62,000 (an Audi A7 cost that much), then you have to pay additional $62,000 as tax. The new ARF is tiered (taxing more on luxury/expensive cars). For the Audi A7, the new OMV will be = $20,000 + 1.4x$30,000 + 1.8x$12,000 = $83,6000. That is a 35% increase with the new ARF! With this change, the price of luxury cars will be adjusted upwards. The rich has to be richer to buy. Of course, if you are buying a Corolla Altis (less than $20,000 OMV), then there is no change. PS: I don’t own a car, and this is the first time understanding the actual costing of one.